With 2 weeks to go before the New Hampshire Indoor Track & Field Championship, the Raymond High School Boys and Girls Track Team competed on Sunday, January 24th in a meet attended by 17 Division III and IV teams and hosted by the University of Southern Maine in Gorham, Maine. For the boys, junior Colton Corriveau ran the 300m in 41.37, which is his new best and is 1.13 seconds shy of the qualifying mark for the Open Meet to be held next weekend at UNH. The Open Meet is a final chance for athletes to attempt to meet the tougher State Meet qualifications. Also for the boys, Sophomore Gavin Call ran the 600m in 1:38.51, also a new personal best, which is just 0.27 seconds shy of the qualifying mark for the Open Meet. Competing in the 1500m were junior Jacob Riley, with a time of 4:59.33, and freshman Kristjan Fraser, with a time of 5:06.16, both of which also were new personal bests. The same 4 boys also improved their 4x400m relay time to 4:17.79. The 4x400m event is contested on very short rest immediately after the 1500m. As a team, the boys tied for 16th out of the 17 teams competing. For the girls, junior Keri Lang competed in her final meet for the season with a time of 1:02.2 in the 300m. Sophomore Anna Harmon had a first place finish in a time of 1:40.68 in the 600m, breaking by 3.06 seconds the school record she set just 9 days earlier. The girl’s team placed 9th overall. ColtonCorriveau and Gavin Call are scheduled to compete in individual events on Wednesday at the Milford Dome in an effort to meet the qualifying marks for the Open Meet next weekend. Jacob Riley, Kristjan Fraser, and juniors Garrity Sargent and Cache Furmanick will compete in the 4x800 relay, also in an effort to qualify for the State Meet. 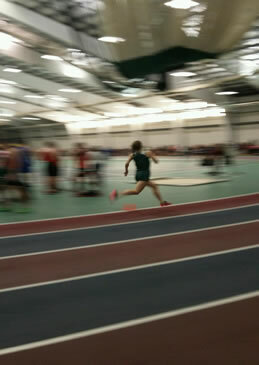 Anna Harmon also will compete at the Dome meet, but already has qualified for the Open Meet. Anna Harmon also has qualified for the State Meet in 3 events, and has met the provisional qualifying marks in 2 other events, ranging from 55m to 1500m.